The Hairy Mussel occurs abundantly along the eastern and southern coasts of Australia as far south as Tasmania, particularly in estuarine localities. Shells of living animals are covered in short bristles (actually modifications of the organic ‘skin’ portion of the intact shell). The shell, measuring up to 60mm in length, is sculptured with numerous radial ribs externally, and internally is smooth and highly iridescent (‘mother of pearl’ nacre). Byssal threads attach these mussels to each other or to rocks on the sea bottom, thereby forming clumps or even extensive beds in intertidal to shallow subtidal areas. Such mussel clumps/beds form an important habitat for numerous other marine and estuarine invertebrates (other molluscs, worms, crustaceans) and vertebrates (small fish), even after death of the mussels themselves. 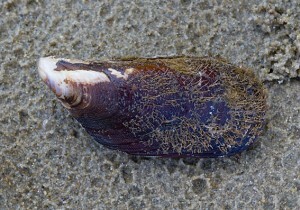 To some extent, the beds of the Hairy Mussel also play a role in the stabilization of muddy-sand sediments. The edibility of this species is attested to by its frequent appearance in Aboriginal shell middens. Indo-Pacific: Eastern and southern Australia.